V2519. 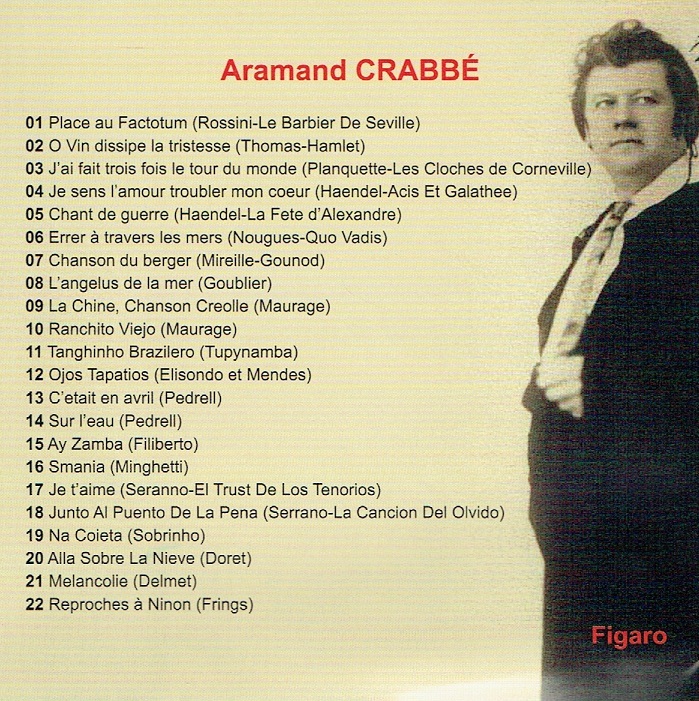 ARMAND CRABBÉ: Songs by Sobrinho (Na Coieta), Minghetti (Smania), Filiberto (Ay Zamba), Pedrell (C'était en Avril), Doret (Alla sobre la nieve), Frings (Reproches à Ninon), Mendez (Ojos tapatios), Maurage (Ranchito viejo; (La Chine), Tupynambé (Tanghinho Brazilero), Goublier (L'angélus de la mer), Delmet (Mélancolie); Arias from Acis and Galatea, Barbiere, Hamlet, Mireille, Les Cloches de Corneville, Quo Vadis, El Trust de los Tenorios (Je t'aime), La Cancion del Olvido (Junto al puente de la Pena) & Alexander's Feast. (France) Malibran 135 [or 132], recorded 1925-29. Final Copy! �Armand Crabb� was a very important baritone, born and trained in Brussels. He sang at the Royal Opera in London, the Manhattan Opera House, and the Chicago Opera Company along with many important European houses. His career extended into the 1930s, and he made a number of important records, both acoustical and electrical (the selections on this new release are all electricals, though we get no information about that from Malibran). 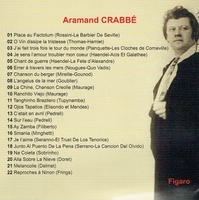 As demonstrated here, Crabb� was a singer with a lovely light tone, much in the French tradition, and a quite extraordinary technique. In addition, he sang with real personality; his recording of Figaro�s aria from THE BARBER OF SEVILLE is one of the very best, even though it is in French. Crabb� is having a ball with it, and as a result we do as well. These recordings were made between 1925 and 1929. In THE GRAND TRADITION John Steane speaks very well of Crabb�. �The French are not often thought of as Handelians, but [an] excellent performance is Armand Crabb�s of �O ruddier than the cherry� from ACIS AND GALATEA, sprightly and wicked in its characterisation, faultless in its placing of the rapid semi-quavers. He was an able technician and a versatile artist, and his record of �Largo al factotum� is one of the few performances of that over-familiar song that actually makes one feel like laughing with the busy barber instead of switching him off�. The Handel recording to which Steane refers is included here, and his description is spot on. Similar praise is due the brilliant singing of the aria from ALEXANDER�S FEAST. Another highlight is the drinking song from Ambroise Thomas� HAMLET. Many famous baritones have recorded it, but Crabb�s must belong near the top of the list. He pays close attention to the words and to the underlying madness of the character, making much of the contrast between the lyrical middle section and the boisterous outer verses. His runs leading into the repeat are remarkably clean and precise. Much of this material is on the lighter side, including a couple of zarzuela arias. Throughout, Crabb� demonstrates all of the virtues of his art: a warm, bright voice with a firm core, steady emission and a smooth legato, clear diction, and above all, a strong vocal personality. He is never merely singing notes. Rather he is communicating effectively the text and the drama behind the notes, whether the mood is serious or comic. In fact, it is his willingness to care about, and take care over, the lighter material in this collection that impresses. Typical of the French style, the voice is forwardly placed and marked by attention to a cantabile line. 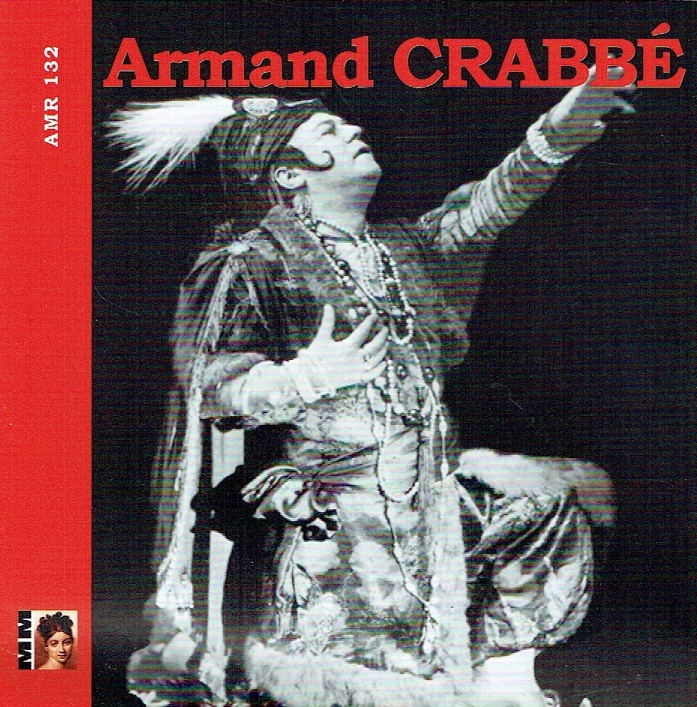 Although very few of his recordings are currently in print, Crabb� merits discussion along with other great French basses and baritones from the first half of the 20th century like Dinh Gilly, Marcel Journet, Maurice Renaud, and Arthur Endr�ze (the latter American-born but French trained). Listen to the beautiful soft singing at the end of Auguste Maurage�s �Ranchito Viejo�, hushed and flexible while retaining full tonal body. In all the Spanish and Brazilian numbers he sounds completely at home. Everything one wants in great singing is present in Crabb�s art. From the perspective of how one should produce transfers of historical material, however, this disc is hardly a model. There is a very brief biographical note in French only. The lack of information about these selections, many of which are likely to be new to you, may detract from your enjoyment and understanding. But you should not let any of that get in the way, since you can intuit the general meaning and mood from the music itself. The transfers are very good. I compared them with some earlier ones on the Club 99 label, and Malibran�s are warmer, with a more natural sound to the voice. "[Crabb�] had an unusually well-schooled voice with great expressiveness and classic beauty, particularly in the higher register�.The voice was light, a classic Baryton-Martin, very supple and capable of singing high notes with ease; in fact, at one point, colleagues suggested he might convert to the tenor range."